allow to rest for 20 minutes off the heat. Reheat and serve over rice. 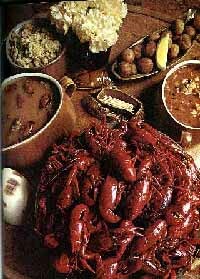 NOTES : To make crawfish stock: boil the heads and shells of crawfish. onions and allow to simmer for 15 to 20 minutes. and celery. Cook until tender. Add bay leaves and thyme. stock, garlic, sliced andouille, and ham. Bring mixture to a boil. Cover and let simmer about 30 minutes or until rice is done. toasted French bread and a green salad. Reduce heat to medium low and continue to cook an additional hour. down and make the mixture creamy. Add the butter and serve.